The African manatee, Trichechus senegalensis, also known as the West African manatee or sea cow, shares many features with the West Indian manatee, so this fact sheet will focus mainly on differences and the unique circumstances of this African species. The African manatee inhabits the warm, shallow coastal waters, rivers, lakes, swamps, and estuaries of Western Africa, from the Senegal River bordering Mauritania in the north to the Cuanza River of Angola in the south. It is mainly nocturnal, and generally feeds and travels from dusk to dawn. It rests in shallow waters during the day. The West African manatee weighs up to 500 kg (1,100 lbs), and is 3-4 meters long (10-13 feet) when fully grown. It has the same brownish, gray coloring as the West Indian manatee, and is generally similar in appearance, though the snout is straighter, i.e., not as downturned. This may be an adaptation that aids it in reaching overhanging vegetation, particularly mangrove leaves, which make up much of its diet. While all manatee species are endangered, West African manatees are possibly the most threatened. They are hunted throughout their range and are accidentally caught in fishing nets. The mangroves they feed on are being cut down, and erosion from logging has caused sediment to build up in lagoons and estuaries, ruining their habitat. 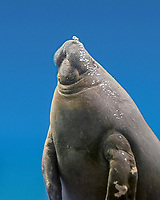 The manatee has legal protection in every country within its range, but the laws are seldom enforced. Hunters appear to be aware of the laws, but few fear punishment. No one knows how many West African manatees exist, but there are assumed to be fewer than 10,000.